The four whiskies from the Cuatro series come from a spirit batch distilled on the same day, the whisky matured for nine years in American Oak casks before being transferred to four different types of Sherry butts for a period of three years. As a result, each of the four expressions has developed their own unique characteristics. Today I explore the second from the series: Manzanilla sherry cask. Manzanilla is an especially light variety of Fino Sherry solely made around the port of Sanlúcar de Barrameda. Like Fino sherry, it is made from the Palomino grape and ages under a layer of flor yeast. This layer is thicker than a normal Fino and thus allows less contact with the air. Manzanilla features dry, salty and maritime flavours. Let's see how this Manzanilla whisky compares to the first Cuatro whisky. Colour: A golden whisky that leaves oily traces on your glass. Nose: The first nosing reveals some nuts, eucalyptus and condensed milk. Some fruity notes of melon and red fruit give it a sweet and sour touch. The nuts evolve into sugared and salted peanuts. Some dried grass lingers around. A drop of water adds fresh citrus and vanilla-lime custard. Taste: A sweet and spicy whisky on the palate. Pepper and peppermint. Some cinnamon, tobacco and dried fruits. Again some citrus but this time it's much more like lemon and orange candy. A drop of water reveals some beeswax and brings back the nutty flavours and bitter chocolate. Finish: The finish starts off dry with walnuts, pepper and ground spices. Candied citrus peel adds a last sweet touch to it. 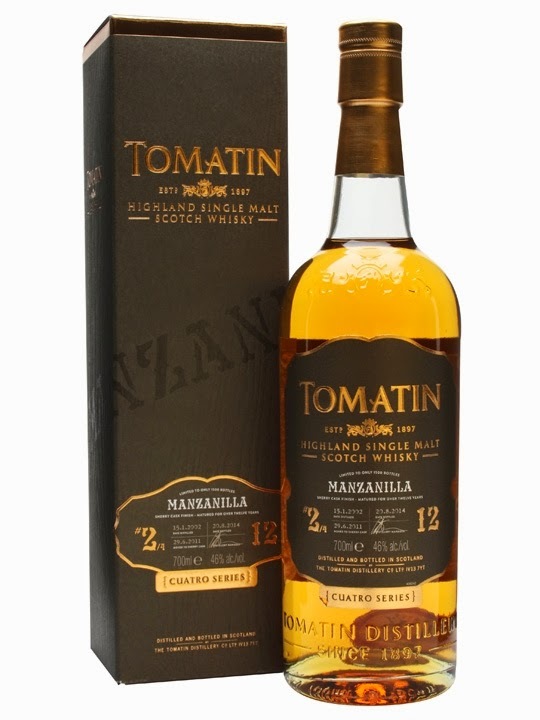 I might spoil things a little bit, but this Manzanilla finished Tomatin ended up as my personal best during the Tweet Tasting. A bit surprisingly maybe, since I'm not a big fan of the Fino and Manzanilla sherry style. But when it comes to finishing a light-hearted Highland whisky, I prefer Manzanilla over the Pedro Ximenez or Oloroso styles. The Cuatro Series is an interesting experiment. It may be inspired from the Glenmorangie 12yo series which are basically the Glenmorangie Original 10yo with an additional 2-year finish in a port, sherry or wine cask. Tomatin pushed the idea a little bit further by splitting up one batch of spirit into 4 different whiskies each with a very specific sherry finish. 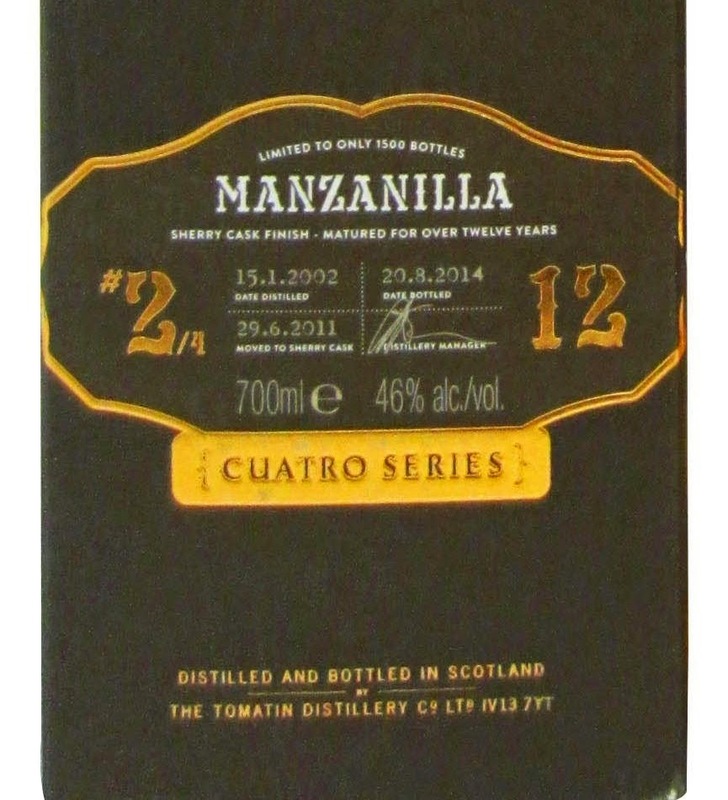 A bottle of the Cuatro series (12 years old, 46% ABV, natural colour and non-chill filtered) costs approximately €68. If you still want a bottle, you'd better be quick. These are already a few months available and Tomatin only released 1.500 bottles of every whisky. Oh, and the marketing dept. added a little detail to the bottles to make sure you would want to collect all four of them. Unless you are perfectly fine with a bottle that states "bottle 1/4"... (I know I would want all four of them).